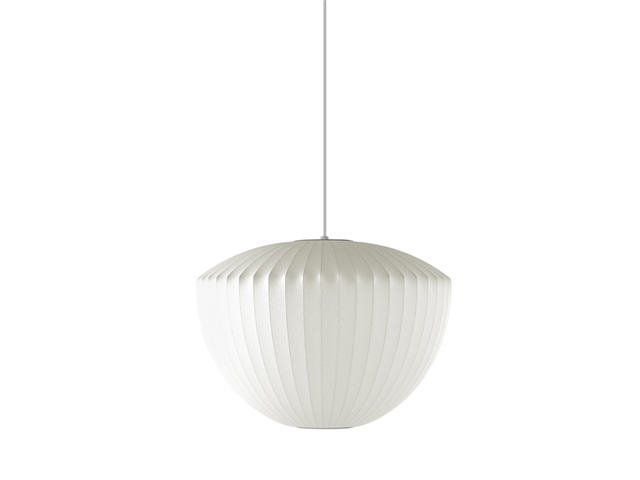 Part of the Nelson Bubble Lamp series, the Nelson Apple Bubble Pendant has a clean, rounded symmetry. Secured with a ceiling plate, it gives the impression of floating overhead, casting a soft, even light. George Nelson designed the series in 1952. He was inspired by a set of silk-covered Swedish hanging lamps. Shaped like its namesake, the Apple Bubble Pendant adds charm and warmth to interiors with its rounded silhouette and soft, even light. It comes with a brushed nickel-plated steel ceiling plate and a 6 foot long cord that allow this pendant light to be affixed to the ceiling. George Nelson first designed the Bubble Lamps in 1952, when he came across a Swedish hanging lamp that he wanted to acquire for his office. Challenged by the expensive price, he decided to make his own. The result was a series of lamps that complement a variety of settings.